One of the things that I really do not like in Firefox is that Mozilla still did not find a way to block the automatic installation of extensions in the browser. Many security programs but also other Internet and even non-Internet related programs add add-ons to Firefox during their installation on the system which I consider a security risk as users do not have a say in the matter. Google announced a new feature for Google Chrome 25 today that is implementing exactly that feature in the browser. Chrome up until now supported the silent installation of extensions in the browser on Windows using the Registry of the system. Originally designed for extension deployment in company networks, the feature has been used by software companies to add extensions to the Chrome web browser without the user's knowledge nor consent. This will no longer be possible from Google Chrome 25 which is currently available in the Dev channel. While it may take a couple of months before the feature will make it into the stable channel, the version of the browser that is used by the majority of users, it is an important security addition that users can look forward to. Two new features have been added to Chrome 25. The first disables extensions that get installed via third party programs by default. 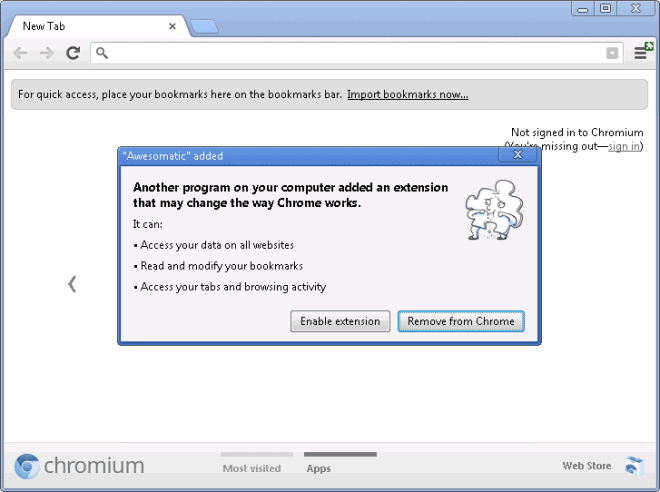 Extensions can still get installed in the browser but instead of being active by default, they are not active and it is up to the user of the browser to activate them or delete them right away in the extension manager. A badge will be displayed that users can click on to display the installation information in the Chrome browser. Chrome informs you about the extension, its access rights and provides you with direct options to enable the extension or remove it from the browser. 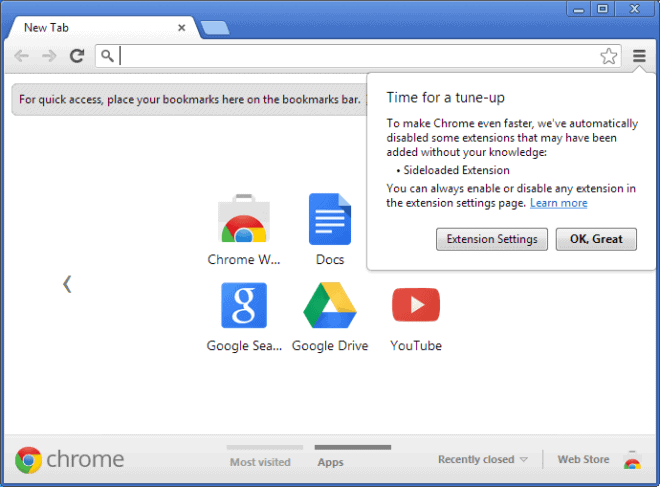 Another program on your computer added an extension that may change the way Chrome works. If you do not pay attention to that dialog then, you can always visit the Chrome extension manager to enable or remove it manually from there. Since it is disabled by default, it won't affect the system until you make a decision. The second feature is related. Chrome 25 will automatically disable all third party extensions that have previously been installed automatically in the browser. Users will get a one time prompt that informs them about that and provides them with options to open the extension settings to make adjustments or do not do anything at all. To make Chrome even faster, we've automatically disabled some extensions that may have been added without your knowledge. You can always enable or disable any extension in the extension settings page. The security addition is a welcome change to Chrome as it improves user security further. Lets hope Mozilla will finally add similar capabilities to the Firefox web browser. Great. That will disable some extensions for virusscanners etc. And much better, also the spyware which is using this more and more. A welcome change indeed! Chrome at least until now provided you with options to directly delete those extensions from the browser. In Firefox, you can only disable them but not remove them using the add-ons manager. I think Chrome did a good move. I don’t like when software installs extensions behind my back, considering that they know better. I will always be a supporter of the idea that the user must be the one making the choice. Also, I believe that the user must become used to making choices, because this is the only way for him/her to become more educated in the IT matters. I’m not using Chrome, and I will still not use it even after this move, but it is a good idea nevertheless. I also like programs that give you the control, and chrome does that in this case while Firefox still does not. Excellent write-up, Martin. One question, though: What is a “bade?” I am assuming from the context that it’s a dialog box, but I’d like to be certain. Sorry it should read badge. anyway that enough to hate Firefox because memory and CPU usage. as i remember i hate Firefox because of this.and always not fixed. Firefox does notifies you when some crap third party extension tries to install it self,so yes you can’t manage the removal from the addon manager,but I’m fine with disabled,by the way I think it must be a year from when Firefox implemented this feature,Chrome did a good job but it’s kind of late!Well you know what they say,better late then never! Firefox does prompt you when a third party is trying to install a new add-on (I believe that you wrote about it a while ago when the feature was added), but you can only disable it, not remove it. Perhaps we’ll see Firefox do this soon.